Polymer is a material created with synthetic and natural polymers from a process called polymerization. During polymerization, monomer molecules undergo a chemical reaction to form polymer. This material is durable and often used to create disposable gloves among many other products. When it comes to disposable gloves, it helps to have a polymer coating. Some disposable gloves even feature a double polymer coating. This coating is preferred on the interior side of gloves making them easy to take on and off. Being able to slide on and slide off disposable gloves during a job is important in a lot of industries where contamination is a concern. Polymer isn’t usually found as a feature with latex gloves but they are available. In fact, the protective coating works best with hydrogels, silicone polymer, polyurethane, acrylics, and nitrile among other blends. 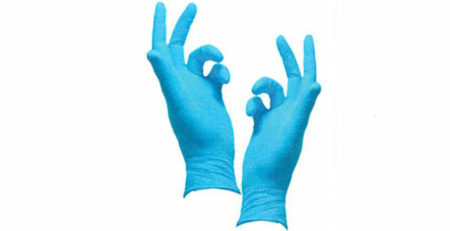 Nitrile gloves are perhaps the most common material other than latex when it comes to disposable gloves. When you add a double polymer coating to the interior of nitrile gloves, it helps them remain odor neutral, consistent in color. Chlorination is a process where disposable gloves are dipped in a diluted chlorine solution to reduce friction when the gloves are in use. After they’ve been dipped, the gloves are then rinsed with an ammonia solution, washed and hung to dry. This act makes the glove smoother yet stronger. As far as deciding between disposable gloves that have undergone the chlorination process versus gloves with a double polymer coating, double polymer seems more favorable. The color fading resistance and durability set it apart from disposable gloves that went through chlorination. 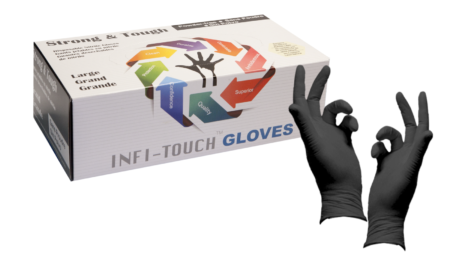 Nevertheless, gloves that have gone through either process are powder-free, which is one of the biggest concerns of professionals who use disposable gloves daily.